Are you ready to experience the sound of the most legendary rock band in the world?? The supergroup Foo Fighters is back with a massive 2018 slog across North America to promote their brand new album, “Concrete and Gold”!! 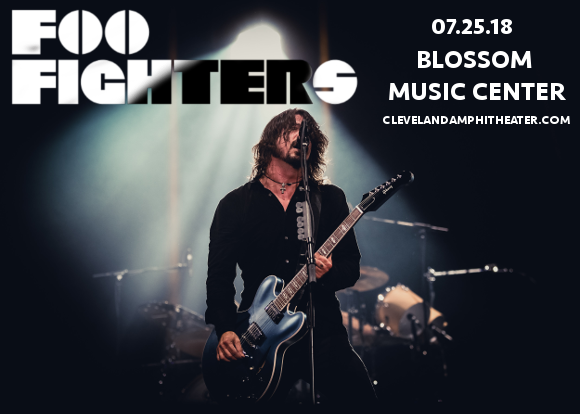 Coming to the Blossom Music Center on Wednesday 25th July 2018 — for what promises to be truly a night of solid gold entertainment! Tickets are on sale and disappearing fast – snap yours up while you can! “Concrete and Gold,” is the 9th album in the Foo Fighters’ highly successful career of 20+ years, the highly anticipated follow-up to 2014’s “Sonic Highways”. In addition to highly political themes, with the recent presidential election having a huge influence on the album, the record is unusual in that features a number of huge guest stars, including Paul McCartney, Shawn Stockman, and Justin Timberlake! We can hardly wait to hear it all live – can you?? No? Then grab those tickets while they last! !